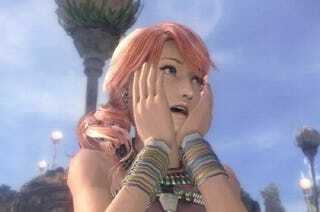 A commercial for Final Fantasy XIII has been reprimanded by Britain's Advertising Standards Authority for using PlayStation 3 footage in an advertisement for the Xbox 360 version of the game. All it took was one viewer to complain to the advertising watchdog that the 360 ad was using PS3 footage for the ASA to sit down with both 360 and PS3 versions of the game. The ASA's statement on the matter says "We tested the two games, on screens with an identical set up, and ran them alongside one another." "We noted that there was a discernible difference in the picture quality of the two - the PS3 image in video sequences appeared sharper and colours were more vivid than those of the XBOX 360." "We considered that, because the ad promoted the game on the XBOX 360 platform, it should have featured footage derived from that console." Following the finding, the ad in its present form can never be shown again on British television. Not that it would, with the game long released, but them's the rules. In Square Enix's defence, the publisher says that the footage was taken from the game's pre-rendered cinematic sequences, and that viewers would only notice the difference watching the content in HD and "reviewing the materially forensically". That said, they did admit that the footage was "played back" on a PS3 for the purposes of making the ad, as it 'allowed advertisers to capture the FMV footage for the advert'. Right. We're a little unsure which commercial it is, exactly, the ruling refers to, so we've contacted Square Enix for clarification.